Sunday school, Manzanar War Relocation Center, 1943. Photographed by Ansel Adams. A Sunday school (also sometimes referred to as a Sabbath school) is a Christian educational institution, usually (but not always) catering to children and other young people. Many Seventh-day Adventist communities hold their Sabbath Schools on Saturdays. 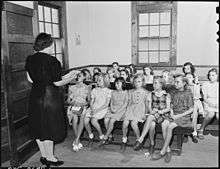 Sunday schools in England were first set up in the 1780s to provide education to working children. William King (see memorial in Dursley Tabernacle Church) first started a Sunday School in Dursley, Gloucestershire, and suggested to his friend Robert Raikes, that he start a similar school in Gloucester, resulting in Raikes being generally quoted as starting the schools as he was editor of the Gloucester Journal and wrote an article in his Journal resulting in many clergymen supporting it. It aimed to teach the youngsters reading, writing and cyphering and a knowledge of the Bible. By 1785, 250,000 English children were attending Sunday School. There were 5,000 in Manchester alone. By 1895, the 'Society for the Establishment and Promotion of Sunday Schools' had distributed 91,915 spelling books, 24,232 Testaments and 5,360 Bibles. 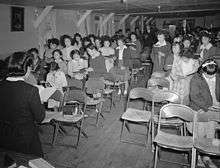 The Sunday School movement was cross-denominational, and through subscription built large buildings that could host public lectures as well as classrooms. In the early days, adults would attend the same classes as the infants, as each were instructed in basic reading. In some towns the Methodists withdrew from the Large Sunday School and built their own. The Anglicans set up their own 'National' schools that would act as Sunday Schools and day schools. These schools were the precursors to a national system of education. The role of the Sunday Schools changed with the Education Act 1870. In the 1920s they promoted sports. It was common for teams to compete in a Sunday School League. They were social centres hosting amateur dramatics and concert parties. By the 1960s, the term Sunday School could refer to the building and not to any education classes. By the 1970s even the largest Sunday School at Stockport had been demolished. Sunday School became the generic name for many different types of religious education pursued on Sundays by various denominations. The first Sunday school may have been opened in 1751 in St. Mary's Church, Nottingham. Another early start was made by Hannah Ball, a native of High Wycombe in Buckinghamshire, who founded a school there in 1769. However, the pioneer of Sunday schools is commonly wrongly attributed to Robert Raikes, editor of the Gloucester Journal, who saw the need to prevent children in the slums from descending into crime. In 18th-century England, education was reserved for a minority and was not compulsory. The wealthy educated their children privately, i.e. at home, with a hired governess, or possibly tutors once they were older; boys of that class were often sent away to boarding school, hence these fee-based educational establishments were known, confusingly, as public schools. The town-based middle class may have sent their sons to grammar school; daughters were left to learn what they could from their mothers or from their father's library. The children of factory workers got no formal education, typically working alongside their parents six days a week, sometimes more than 13 hours a day. In 1781, after prompting from his friend William King who was already running a Sunday School in Dursley, Raikes saw the plight of children living in the Gloucester slums. In the home of Mrs. Meredith, he opened a school on Sunday, the only day these boys and girls living in the slums and working in the factories could attend. Using the Bible as their textbook, he taught them to read and write. Within four years over 250,000 children were attending schools on Sunday throughout England. 1784 was an important year, with many new schools opening, including the interdenominational Stockport Sunday School, which financed and constructed a school for 5,000 scholars in 1805; in the late 19th century this was accepted as being the largest in the world. By 1831 it was reported that attendance at Sunday schools had grown to 1.2 million. Robert Raikes' schools were seen as the first schools of the English state system. The first Sunday school in London opened at Surrey Chapel under Rowland Hill. By 1831, Sunday schools in Great Britain were attended weekly by 1,250,000 children, approximately 25 percent of the population. They provided basic literacy education alongside religious instruction. In 1833, "for the unification and progress of the work of religious education among the young", the Unitarians founded their Sunday School Association, as "junior partner" to the British and Foreign Unitarian Association, with whom it eventually set up offices at Essex Hall in central London. The work of Sunday schools in the industrial cities was increasingly supplemented by ragged schools (charitable provision for the industrial poor), and eventually by publicly funded education under the late 19th-century school boards. Sunday schools continued alongside such increasing educational provision, and new forms also developed such as the Socialist Sunday Schools movement which began in the United Kingdom in the late 19th century. The earliest recorded Sunday School programme in Ireland goes back to 1777 when Roman Catholic priest Daniel Delany - later (1787) Bishop Daniel Delany of Kildare and Leighlin - started a school in Tullow, County Carlow. This was a very sophisticated system which involved timetables, lesson plans, streaming, and various teaching activities. This system spread to other parishes in the diocese. By 1787 in Tullow alone there were 700 students, boys and girls, men and women, and 80 teachers. The primary intent of this Sunday School system was the teaching of the Catholic faith, the teaching of reading and writing became necessary to assist in this. With the coming of Catholic Emancipation in Ireland (1829) and the establishment of the National School system (1831) when the Catholic faith could be taught in school, the Catholic Sunday School system became unnecessary. The Church of Ireland Sunday School Society was founded in 1809. The Sabbath School Society of the Presbyterian Church in Ireland was founded in 1862. The American Sunday school system was first begun by Samuel Slater in his textile mills in Pawtucket, Rhode Island, in the 1790s. Notable 20th-century leaders in the American Sunday School movement include: Clarence Herbert Benson, Henrietta Mears, founder of "Gospel Light". , Dr. Gene A. Getz, Howard Hendricks, Lois E. LeBar, Lawrence O. Richards and Elmer Towns. Philanthropist Lewis Miller was the inventor of the "Akron Plan" for Sunday schools, a building layout with a central assembly hall surrounded by small classrooms, conceived with Methodist minister John Heyl Vincent and architect Jacob Snyder. John Heyl Vincent collaborating was Baptist layman B. F. Jacobs, who devised a system to encourage Sunday school work, and a committee was established to provide the International Uniform Lesson Curriculum, also known as the "Uniform Lesson Plan". 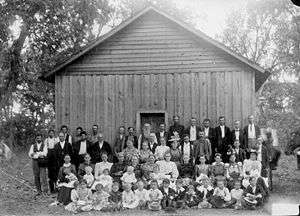 By the 1800s 80% of all new members were introduced to the church through Sunday school. In 1874, interested in improving the training of Sunday school teachers for the Uniform Lesson Plan, Miller and Vincent worked together again to found what is now the Chautauqua Institution on the shores of Chautauqua Lake, New York. Sunday school, Indians and whites. Indian Territory (Oklahoma), US, c. 1900. Sunday schools, contrary to the name, are virtually never recognized educational institutions; rather than offering formal grades or transcripts, Sunday schools simply attempt to offer meaningful instruction concerning Christian doctrine and keep little or no record of performance for any given week. Attendance is often tracked as a means of encouraging children to attend regularly, and awards are frequently given for reaching attendance milestones. Historically Sunday Schools were held in the afternoons in various communities often staffed by workers from varying denominations. Beginning in the United States in the early 1930s and Canada in the 1940s the transition was made to Sunday mornings. Sunday school often takes the form of a one-hour or longer Bible study which can occur before, during, or after a church service. While many Sunday schools are focused on providing instruction for children (especially those occurring during service times), adult Sunday school classes are also popular and widespread (see RCIA). In some traditions, the term "Sunday school" is too strongly associated with children and alternate terms such as "Adult Electives" or "religious education" are used instead of "Adult Sunday school". Some churches only operate Sunday school for children concurrently with the adult worship service. In this case there is typically no adult Sunday school. There are a number of traditional children's hymns or "Sunday school songs", such as "The Wise Man Built His House Upon the Rock," "Jesus Bids Us Shine", and "Jesus Loves Me" that have frequently been used in Sunday school settings. It is rare nowadays, but some Sunday schools required children to wear a uniform. This usually consisted of a dress shirt and necktie, with v-neck sweater for boys. For girls it would usually be a skirt with blouse and sometimes also a tie. In Great Britain an agency was formed called the Religious Tract Society which helped provide literature for the Sunday School. In the United States the American Sunday School Union was formed (headquartered in New York City) for the publication of literature. This group helped pioneer what became known as the International Sunday School Lessons. The Sunday School Times was another periodical they published for the use of Sunday schools. LifeWay Christian Resources, Gospel Light, David C. Cooke, and Group Publishing are among the widely available published resources currently used in Sunday schools across the country. Sunday school teachers are usually lay people who are selected for their role in the church by a designated coordinator, board, or a committee. Normally, the selection is based on a perception of character and ability to teach the Bible rather than formal training in education. Some Sunday school teachers, however, do have a background in education as a result of their occupations. Some churches require Sunday school teachers and catechists to attend courses to ensure that they have a sufficient understanding of the faith and of the teaching process to educate others. Other churches allow volunteers to teach without training; a profession of faith and a desire to teach is all that is required in such cases. It is also not uncommon for Roman Catholic priests or Protestant pastors (church ministers) to teach such classes themselves. Some well-known public figures who teach, or have taught, Sunday school include astronaut Ron Garan, comedian Stephen Colbert, novelist John Grisham, and former U.S. president Jimmy Carter. Rowe, Mortimer, B.A., D.D. The History of Essex Hall. London:Lindsey Press, 1959. Full text reproduced here. 1 2 3 4 Collins, Louanne (1996). Macclesfield Sunday School 1796- 1996. Macclesfield, Cheshire: Macclesfield Museums Trust. ISBN 1-870926-09-9. 1 2 3 Davies, Stella (1961). History of Macclesfield (Reprint 1976 ed.). Didsbury, Manchester and Macclesfield: E.J.Morten. pp. 219–225. ISBN 0-85972-034-9. ↑ "Robert Raikes and the Sunday School Movement". Retrieved 2007-10-26. ↑ Matthew, Russell, “Sketches in Irish Biography, No. 28, Dr. Daniel Delany”, The Irish Monthly, Volume 23, 1895. ↑ Rev. Martin Brenan, Schools of Kildare and Leighlin, A.D. 1775 - 1835, M.H. Gill and Son, Ltd, Dublin, 1935. ↑ John M Barkley, The Sabbath School Society for Ireland, 1862 - 1962 (Sabbath School Society for Ireland, 1961). ↑ Little, Ellen. "Periodicals published by The American Sunday-School Union". University Library System, University of Pittsburgh. Archived from the original on 4 February 2012. ↑ Anderson, Don (11 November 2013). "Choosing Sunday School Curriculum: How Effectively Do You Want to Teach the Bible?". Faith.edu. ↑ "Maranatha Baptist Church". Maranatha Baptist Church. Plains, Georgia. Bergler, Thomas E. The Juvenilization of American Christianity. Grand Rapids, MI: William B. Eerdmans, 2012. Broadbent, Arnold. The First 100 Years of the Sunday School Association: 1833-1933. A centenary booklet issued by the Lindsey Press of the General Assembly of Unitarian and Free Christian Churches. Look up Sunday school in Wiktionary, the free dictionary.